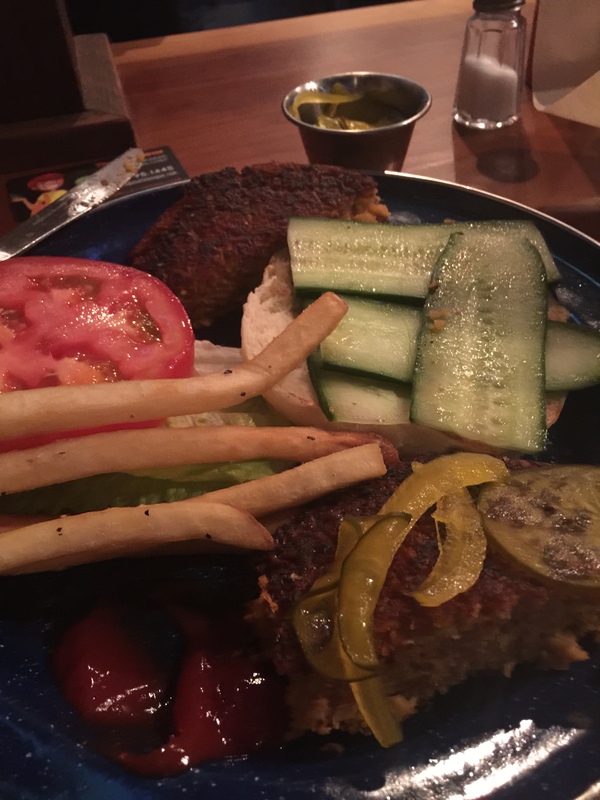 Napa Palisades Saloon Serves Up Vegan Vittles! After reading an article about Napa Palisades Saloon having a vegan-friendly menu, I figured it was time to go check out downtown Napa’s newest bar. But since giving up meat eight years ago, when it comes to dining out, the word spontaneity no longer exists in my vocabulary. When Steve and I plan to go out for a meal, schedule a road trip or fly out of town…I have to research (ad nauseam) to find out what and where my vegan dining opportunities will be. And to be honest, I have lost count of all of the times that I have been told or read that a place has veg-friendly choices only to walk in and be met with a blank stare. 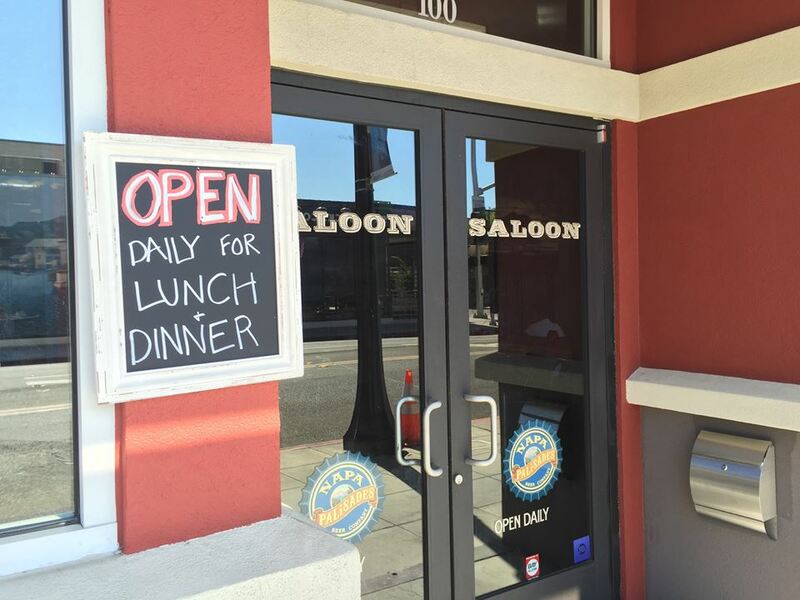 So, first I checked out the Saloon’s menu. As has become the norm with restaurants in Napa Valley, there was no indication on any of the menu items whether anything was vegetarian or vegan-friendly. Well, I thought, someone wrote an article and specifically mentioned that the Saloon offered vegan options so I didn’t give up there. Next step. I called. There was no answer so I left a voicemail message introducing myself, my blog and my interest in trying their food so could someone give me a call back? And then I waited…and waited. After a week or so went by, I realized that I was probably not going to hear back from anyone. My thoughts at that point were…well, if they are doing that well that they don’t need my business, okay…they won’t get my business. And then I got back to my crazy busy life and promptly forgot all about them! Then on Labor Day, I received a comment from one of my new blog followers, Jennifer. She mentioned in her comment that she had recently dined at Napa Palisades Saloon and had really enjoyed the experience. I am a big believer in “signs” and that was the sign I needed to give this another shot. The following week Steve and I had a Wednesday evening free so headed downtown to check this joint out! We got there at about 7 p.m. and the place was packed. I’m in my mid-40s now, and though you may not believe it by reading my blog postings, I am more of a foodie than an oenophile. And with all of the Michelin starred restaurants and highly respected Chefs in Napa Valley, when I walk into an establishment I expect to walk into a restaurant that happens to have a bar. It may be an excellent bar, but the bar is always secondary to the food experience. So imagine my surprise when I walked into Palisades. It was a loud, busy, full-fledged bar that just happened to have some tables! Every one of the 6 or 7 tables was full, all 15 bar stools were taken, loud music and even louder voices filled the air and there were 8 flat screens filled with sports. Besides the wrinkles and the need for reading glasses to see the menu, I felt like a 20-something again! The saloon is small – I didn’t have to get very far passed the doorway to see that seating was limited. But as I looked around, I found 2 chairs tucked into the end of the bar. And though I haven’t been a 20-something in a few years, I knew the seats were going to go fast if I didn’t take them! It felt really strange at first…our seats were just regular height chairs that tucked into a desk-like dining table that butted right up to the bar. We were looking up at all of the other patrons AND the bartender like we were at the kiddy table. But once we got settled in, we had this whole space for my handbag, our food and plenty of room for drinks. It felt really intimate and though we only sat there by default I’m going to try for those seats every time I go in now! The kiddy table is at the bottom left of this photo! 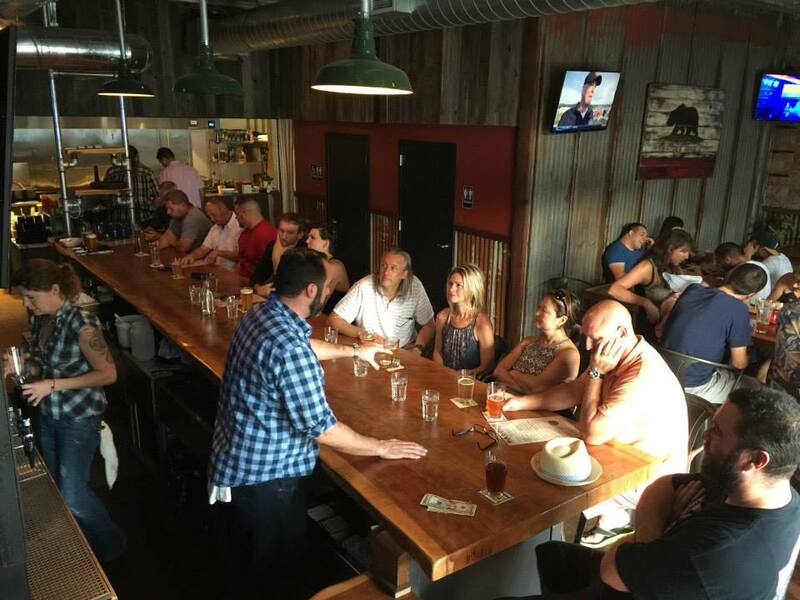 The table gave me a great view of the whole place – it has a rustic industrial vibe. The bar top is made of wood but the HVAC duct work along the ceiling gives it the feel of a small warehouse. The kitchen is wide open showing all of the stainless steel appliances. I really liked the feel of it – I lived in an old unrenovated loft in LoDo (Lower Downtown Denver) near Union Station and Coors Field in my late 20s and it took me back to that rather boozy, happy phase of my life! I mentioned earlier that since making the switch to a humane lifestyle, I tend to be a bit obsessive about my research. Well, thanks to Jennifer, I did not have to spend any more time researching my food so I decided to take a look at their Drink menu. I drink wine, I really like wine but sometimes I just need a damn break from wine. Beer…used to drink it, never really liked it, so never drink it anymore. Ahh, but then I spied the hard cider! Yes! I love hard cider. Years ago, my sister Christy spent a college term in Moscow. At that time (and maybe it still is…) it was really hard to get into Russia. So, when she finished up her term we met in Paris instead. We spent the next couple weeks exploring Paris, Calais, Dover, London and the stunning Lake District in Northern England. It was through these journeys that I had my first Burger King veggie burger experience (I never liked eating meat even when I was a meat eater!) and I had my first Strongbow Cider. It seemed to be on tap at every single pub and I loved it! Hmmm…I just realized that cider is almost like combining beer with wine. Interesting! Anyway, that is how my love affair with cider began. However, just like wine and beer, sometimes animal product is used in the fermentation or filtration process of cider. Unfortunately, Strongbow is not vegan-friendly but I will always have beautiful memories of the time we spent together abroad. When researching the vegan-friendliness of a drink, I always prefer to go straight to the source whenever possible. That is what has been so interesting but time-consuming about doing the research for my blog. When I can’t go straight to the source, I do sometimes use Barnivore.com. It is a very helpful resource to use if I don’t have access to the master brewer or winemaker. The Saloon has two hard ciders on their menu – Crispin Pear is available by the bottle and Foxcraft Blood Orange is on tap. 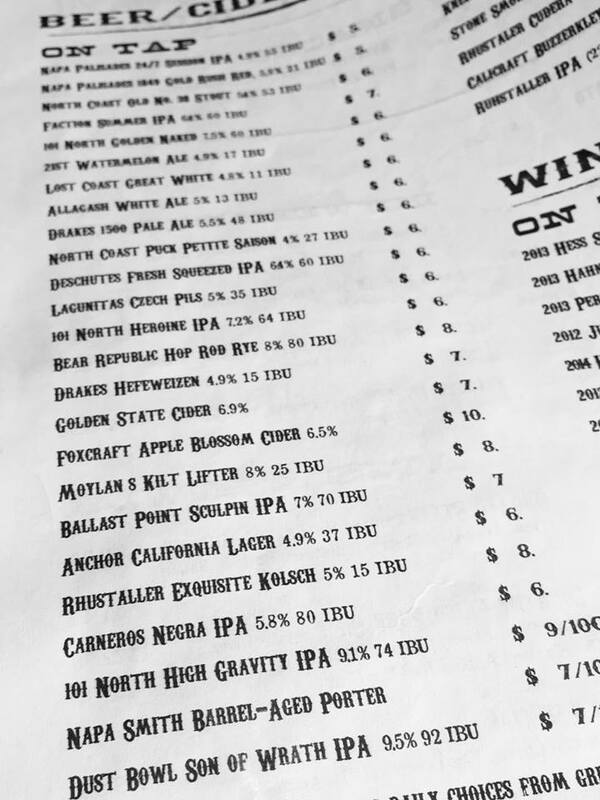 Their online menu lists Golden State cider available on tap but according to their bartender, Chris, they no longer offer it. If you find it somewhere else though, it is vegan. Yay! I found Crispin on Barnivore.com and they do not use ANY animal products in the production of their ciders. They do make a couple that contain honey but the Saloon currently only offers the pear cider which is vegan-friendly. Foxcraft is not listed on Barnivore’s website so I headed over to Facebook to see if I could have some dialogue with them there. I’ve got to tell you that they were amazing! They confirmed with their master brewer that they do not use any animal products while creating the cider. They pride themselves on creating a clean, additive free hard cider. 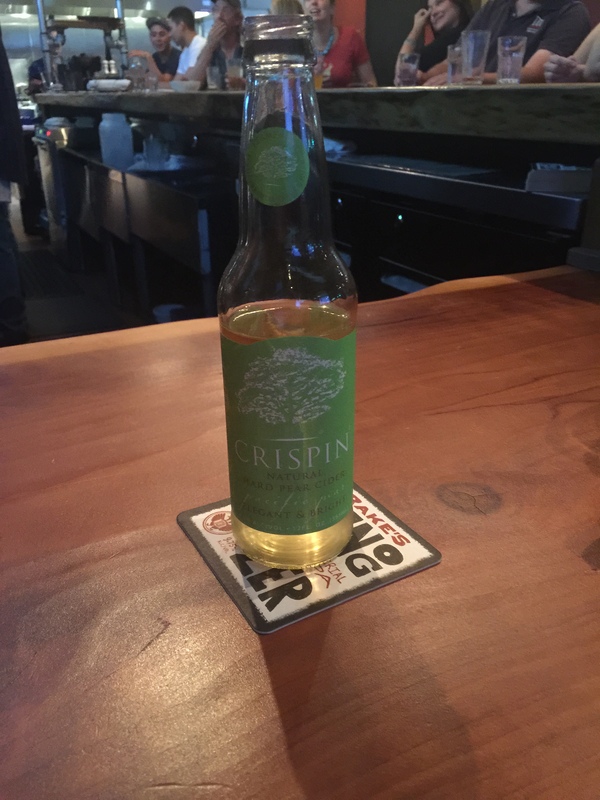 I did not learn this until after I had left Palisades so I ordered the Crispin Pear cider. It was so good I had 2 bottles! And I picked up a four pack of the blackberry pear cider this week. I will absolutely try the Foxcraft cider the next time I head to the Saloon. They worked so hard to answer my questions so the least I can do is support them and drink their cider! Okay, so once I got my drink it was time to get to the food! I went over the menu with Chris and he took all of my questions back to their Chef. This is what we came up with – vegan bar snacks include the crispy chickpeas with chili and lime and the avocado toast drizzled with habanero oil (just ask them to remove the cheese!). The Between Breads option is the crispy falafel burger made without the dairy. Vegan Sides include the green beans with garlic and lime and the fries. While ordering, I missed the beets with avocado, nuts and lime under the Apps section of the menu. You will need to ask but they may be able to make that vegan if they hold the honey and goat cheese! I wanted to try everything but settled for the falafel burger, fries and an order of the avocado toast. The burger came on a big platter with a huge bun, lettuce, tomato and these really tasty pickled veggies. I skipped the bun and dug into the burger. It was crispy on the outside and soft and tasty on the inside. The fries came out hot and salty and just about perfect. The avocado drizzled with the habanero oil was so simple yet so delicious. I will definitely order the avocado toast again! It was a lot of food for two people. We finished off the fries and toast but I got to take half the burger home for later! And to feel even better about the food I ate, they also use local and organic ingredients. The bar is located at 1000 Main Street, Suite 100 in downtown Napa and is a great place to meet up with friends. And from the crowd that was there that night, it is obvious that a lot of other Napkins feel the same way! Thanks for joining me again on my vegan adventures. I look forward to running into you at Napa Palisades Saloon and as always…eat, drink and be vegan!